I learned early on in my career as a newspaper reporter that the truth can be elusive. “People lie,” is the mantra of Dr. Gregory House, the wildly popular fictional TV character. “People embellish,” is my decidedly more benign take on the matter as it pertains to family stories. In the nearly half-century since the fatal plane crash that killed the singers, dozens have claimed to have avoided fate by either passing up a seat on that four-seater plane at the last minute or skipping that tour altogether. It wasn’t just celebrities that exaggerated their roles in the tragedy, either. Time and again I was referred to people who had had contact with the singers around the time of the crash and had told hair-raising versions of “the real story.” Time and again when these people realized they were being interviewed on the record for a book, they backed off their versions and told a much tamer, less remarkable tale. Embellished family stories are common. Sometimes we know they’re not true, but pass them on anyway. Sometimes we enjoy the different versions of the same story that are floating about. Sometimes we simply don’t know where the truth lies. Each family deals with this differently. Here is how storyteller Ann Hagman Cardinal dealt with the shock of discovering the truth behind some of her favorite family stories. Joe McKeever describes the role that embellished family stories plays in his family’s reunions. Larry Lehmer is a personal historian who helps people preserve their family histories. If you’d like to know more, visit his web site or e-mail him. 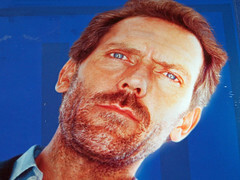 Flickr photo of Hugh Laurie as Dr. Gregory House courtesy of improv_7. There's a continuum between clerical error and outright fabulism. I'm glad you're talking about this topic (tho the recent carnival of genealogy did cover family myths), as it's one that interests me, too. Good comments, Susan. A harmless little white lie or exaggeration among family is one thing; a blatant, intentional public misrepresentation is something else. Besides, in most cases the truth is more interesting.